What luxury to have the benefit of a large space at the top of the house dedicated to quiet pursuits. 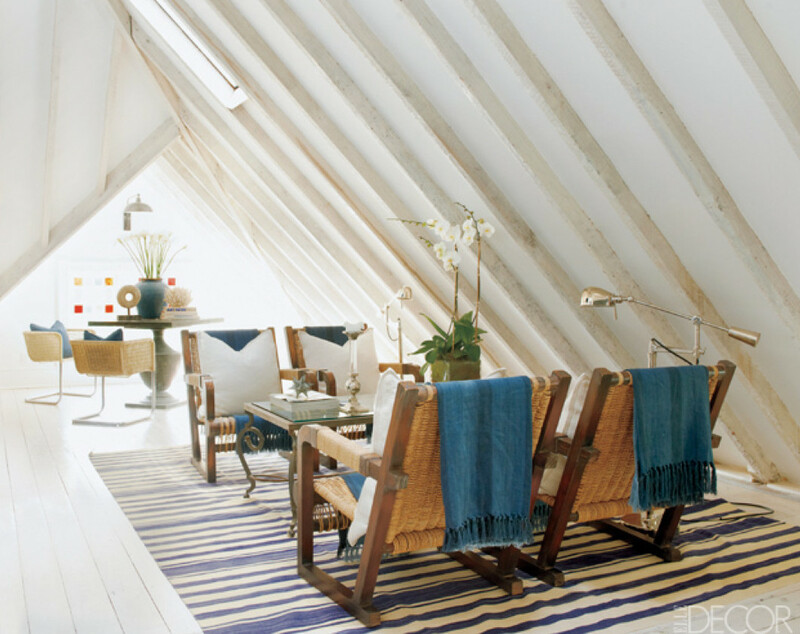 The concept of an attic reading room is novel today — no pun intended. It also seems ideal for chess enthusiasts or avid card or backgammon players. My next door neighbor converted his attic into an enormous master suite and over the years we’ve shown attic spaces transformed into media rooms, mom caves, cosets, kid’s rooms, playrooms and home offices — an approach that turns on functional living. A New York couple took a different tack with their renovated an 1885 shingle style Victorian house on the main street of a historic Long Island hamlet. Their third floor boasted a turret (most suitable for bird-watching) and an open space with the original beamed ceiling and a stained glass window at one end [top]. The main seating area uses a blue and white stripped dhurrie rug which cleverly continues the visual lines of the beams. Ralph Lauren woven armchairs and lamps help complete the furniture grouping. In keeping with their desire for a young and modern house that also respected it’s history, they opted for a whitewashed quiet room. Helping things along is that one of the couple is a store window set designer and both are antiques buffs. The zinc table in front of the window was sourced at the famed Brimfield Antiques fair which takes place each summer in Massachusetts. 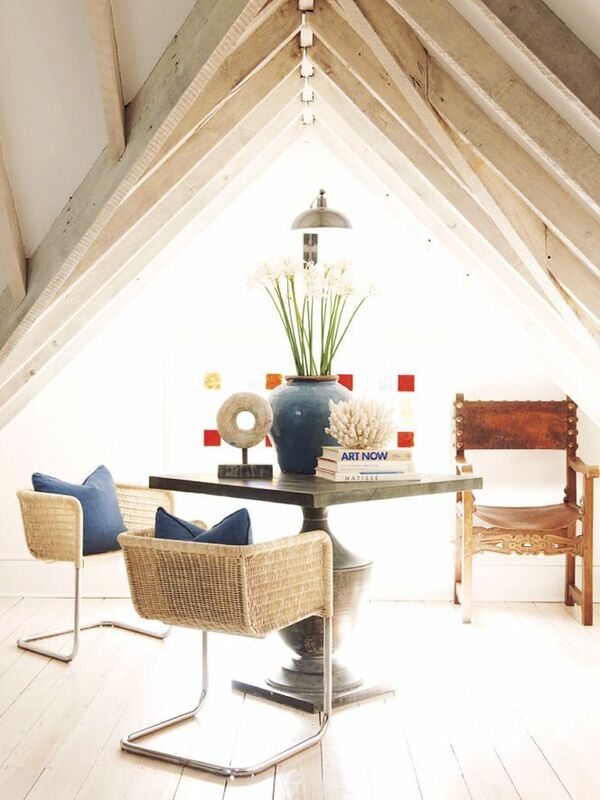 While an attic reading room may not be everyone’s idea of a way to utilize extra space this approach leaves the space open to reinterpretation since the furniture is so basic it could easily be moved elsewhere in the house leaving a blank white third-floor canvas with great light and a street view.